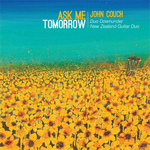 Ask me tomorrow / John Couch, Duo Downunder, New Zealand Guitar Duo. Linn Linnaeus : duet for violin and guitar / Marian Budos. Linn Linnaeus was written to celebrate the 300th anniversary of the birth of the Swedish botanist Carl Linnaeus, the father of modern plant and animal classification. The commission came from violinist Judith Hickel and guitarist John Couch, who were asked by the Swedish Embassy in Canberra to prepare a programme of music for the opening of the Linnaeus Garden at the festival of flowers, Floriade in Canberra in September 2007. The concert programme was titled 'The Four Seasons of Sweden'. This became the structure of this piece: four movements, each representing one season of Linnaeus's life. Difficulty: Advanced — Rhythmically intricate 1st mvt, very fast 2nd and 3rd movements, slow reflective 4th mvt. Contents note: 1. Poet or Botanist? (Spring) -- 2.Trip To Lapland (Summer) -- 3.Gardens of Uppsala (Autumn) -- 4. Raindrops in the Cathedral (Winter). Commission note: Commissioned by John Couch, Judith Hickel.. Commissioned by Judith Hickel, John Couch. 11 Sep 10: The Independent, 269 Miller St. Featuring Judith Hickel, John Couch. 9 Sep 10: Wesley Music Centre, Canberra. Featuring John Couch, Judith Hickel. 12 Feb 10: Belconnen Arts Centre, ACT. Featuring Judith Hickel, John Couch. 7 Dec 08: Pestalozzisaal, Biberach, Germany. Featuring John Couch, Judith Hickel. 5 Dec 08: Freie Evangelische Gemeinde, Heidelberg, Germany. Featuring Judith Hickel, John Couch. 28 Nov 08: Jugendmusikschule, Bruhl ,Germany. Featuring Judith Hickel, John Couch. 27 Sep 07: Wesley Music Centre, Forrest, ACT. Featuring Judith Hickel, John Couch.